Version 4.1 of WordPress, named “Dinah” in honor of jazz singer Dinah Washington, is available for download or update in your WordPress dashboard. 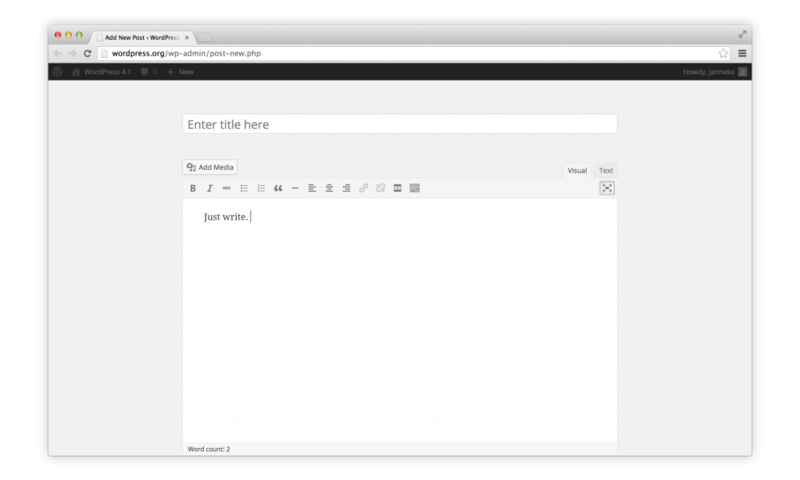 New features in WordPress 4.1 help you focus on your writing, and the new default theme lets you show it off in style. 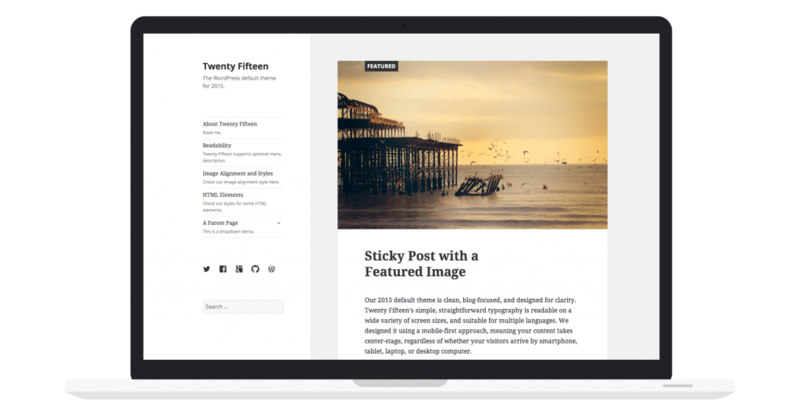 Our newest default theme, Twenty Fifteen, is a blog-focused theme designed for clarity. add_theme_support( 'title-tag' ) tells WordPress to handle the complexities of document titles. Aaron D. Campbell, Aaron Jorbin, Adam Silverstein, akumria, Alex Concha, Alex Mills (Viper007Bond), Alex Shiels, Allan Collins, Amaury Balmer, Amruta Bhosale, Andrea Fercia, Andrea Gandino, Andrew Munro (sumobi), Andrew Nacin, Andrew Ozz, Andrew Ryno, Andrey "Rarst" Savchenko, Ankit Gade, Ankit K Gupta, Anthony Burchell, arippberger, Austin Matzko, Bainternet, Barry Kooij, Ben Dunkle, Ben May, Bernhard Riedl, Birgir Erlendsson (birgire), bobbingwide, Boone B. Gorges, Brady Vercher, Bram Duvigneau, Brandon Kraft, Brian DiChiara, Brian Richards, Brian Watson, Camden Segal, Captain Theme, Carlos, Caspie, ccprice, Charles Fulton, ChriCo, Chris Aprea, Chris Jean, Chris Marslender, Chris Reynolds, chriscct7, chrisl27, Christian Foellmann, Christopher Finke, Corey Snow, Corphi, curtjen, Damon Cook, Dan Cameron, Daniel Bachhuber, Daniel Convissor, Darren Ethier (nerrad), Daryl Koopersmith, Dave McHale, David A. Kennedy, David Cavins, David Herrera, David Laietta, David Wood, DavidTheMachine, Dennis Ploetner, Dion Hulse, Dirk Weise, Dominik Schilling, Dominik Schwind, Drew Jaynes, Dustin Filippini, Dustin Hartzler, Elio Rivero, Eric Binnion, Eric Holmes, Eric Lewis, Fabien Quatravaux, florianziegler, Gabe Shackle, Gary Cao, Gary Pendergast, Gennady Kovshenin, George Olaru, George Stephanis, Greg Rickaby, Gregory Cornelius, Gregory Karpinsky (@tivnet), Gustavo Bordoni, hardy101, hauvong, Helen Hou-Sandí, heshiming, honeysilvas, hugodelgado, Ian Stewart, ianmjones, Ignacio Cruz Moreno, imath, Ipstenu (Mika Epstein), Ivan Kristianto, J.D. Grimes, jaimieolmstead, jakub.tyrcha, janhenckens, Janneke Van Dorpe, Japh, Jared Wenerd, jarednova, jeanyoungkim, Jeff Farthing, Jeff Stieler, Jeremy Felt, Jeremy Herve, Jesin A, Jesper Johansen (jayjdk), Jesper van Engelen, Jesse Pollak, jipmoors, Joe Dolson, Joe McGill, John Eckman, johnrom, johnstonphilip, Jon Brown, Jon Cave, Jonathan Brinley, Jonathan Desrosiers, Joost de Valk, Jordi Cabot, Joshua Abenazer, JOTAKI Taisuke, jrf, Julien Liabeuf, Justin Sainton, Justin Sternberg, K.Adam White, Kailey (trepmal), kamelkev, karpstrucking, keesiemeijer, Kelly Dwan, Kevin Langley, Kiko Doran, Kim Parsell, Kirk Wight, kitchin, Kite, Knut Sparhell, Konstantin Kovshenin, Konstantin Obenland, Kostas Vrouvas, kristastevens, Kurt Payne, Lance Willett, Laurens Offereins, linuxologos, Liuiza Arunas, loushou, Lutz Schroer, Manoz69, mantismamita, Marco Schmoecker, Mario Peshev, Marius (Clorith), Mark Hudnall, Mark Jaquith, Mark Senff, Marko Heijnen, marsjaninzmarsa, Matias Ventura, Matt Mullenweg, Matt Wiebe, Matthew Boynes, Matthew Haines-Young, mattkeys, Maura Teal, Mel Choyce, Mert Yazicioglu, Michael Adams (mdawaffe), Michael Arestad, Michael Beckwith, Michael Cain, Michael Pick, michalzuber, Michelle Langston, Miguel Fonseca, Mike Hansen, Mike Jolley, Mike Nelson, Mike Schroder, Mikey Arce, Mitch Canter (studionashvegas), Morgan Estes, Morten Rand-Hendriksen, mvd7793, Nashwan Doaqan, Niall Kennedy, Nick Halsey, Nikhil Vimal, Nikola Nikolov, nobleclem, noplanman, Nowell VanHoesen, OriginalEXE, p_enrique, Paul de Wouters, Paul Schreiber, Paul van Zyl, Paul Wilde, pavelevap, Peter Chester, Peter J. Herrel, Peter Westwood, Peter Wilson, Philip Arthur Moore, phpmypython, Pippin Williamson, Prasath Nadarajah, psycleuk, Ptah Dunbar, quietnic, Rachel Baker, Rami Yushuvaev, ramiabraham, Reuben Gunday, Rian Rietveld, Richard Archambault, Ricky Lee Whittemore, Robert Chapin, Rodrigo Primo, Ryan Boren, Ryan Kienstra, Ryan McCue, Sakin Shrestha, Sam Hotchkiss, Samuel Wood (Otto), Scott Kingsley Clark, Scott Reilly, Scott Taylor, Sergey Biryukov, Shawn Hooper, Simon Pollard, Simon Wheatley, skaeser, Slobodan Manic, socki03, solarissmoke, Stephane Daury, Stephen Edgar, Stephen Harris, Steve Grunwell, Sumit Singh, TacoVerdo, Takashi Irie, Takayuki Miyauchi, Tammie, Tareq Hasan, Taylor Lovett, Thomas Kraftner, Thorsten Frommen, Till, Tobias Schutter, TobiasBg, Toby McKes, Tom J Nowell, Tomas Mackevicius, TomHarrigan, Topher, Torsten Landsiedel, Tracy Levesque, transom, Travis Smith, Ty Carlson, Udit Desai, Umesh Kumar, Vinod Dalvi, vlajos, voldemortensen, Weston Ruter, Yoav Farhi, Yuta Sekine, Zack Rothauser, and Zack Tollman. There were 283 contributors to this release, again a new high. 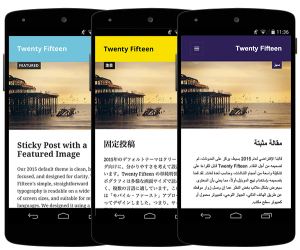 If you want to help out or follow along, check out Make WordPress and our core development blog. Thanks for choosing WordPress. Happy holidays and see you next year for version 4.2!